Over and over again, transpeople assure anyone who asks that of course being transgender has nothing to do with stereotypes. Gosh, it’s not about clothes or makeup or mannerism, they say. Then in their own forums, they turn right around and contradict this tale. This was just a few of the comments in a single reddit post. How many of these must we post before the trans community admits that stereotypes of what women and men are play a role in the increase of people transitioning? I’m a third generation tomboy, none of us were really pressured to be feminine by family, all very physically strong and assertive. If you get rid of the pressure to be feminine part of being a girl, you’re left with a lot of people trying to keep you down. How ludicrous would they sound saying they knew they are girls because they got paid too much at their job, promoted too soon? Or they weren’t discouraged at sports or math? Not enough strangers thought you were stupid? No stranger followed you all the way home? No strangers flashed you? What are they even complaining about? Lol, dresses and make up are things you can buy to your hearts content now, go ahead, it’s got nothing to do with being a girl in this world. 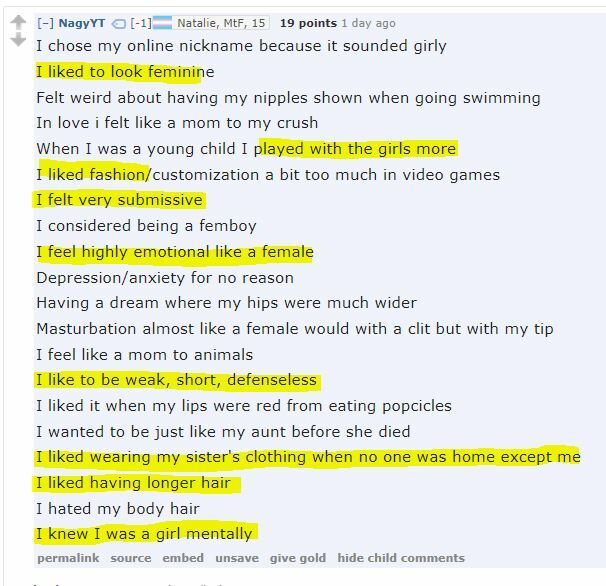 I suspect every single one of these people fantasizing about girlhood would be totally devastated by it if they went through it for a week. Being a girl means being incredibly tough while society believes you’re the epitome of weakness. Would be hilarious if not for the legal changes happening in response to this foolishness. Has it ever occurred to you that the reason stereotypes persist is because they are born out of certain realities? Nobody forced me to clomp around in my mother’s heels instead of my father’s shoes when I was little. Nobody forced me to prefer lipstick and hairspray over shaving cream and cologne when I’d copy my parents as they were getting ready to go out. As a five year old, I was free to pretend to be whatever I wanted, and I wanted to be like my mom. How do you know what it is like to “be” your mom? Do you think your mom sees out of her eyes? That thoughts flow through her head that have nothing to do with heels and lipstick?